Innerloc’s revolutionary Blade Alignment Technology BAT finally lets you precisely tune broadheads to your carbon arrows. Setting all of your broadhead blades so they leave the bow the same way each time assures better grouping. This forces them to react to the air they are traveling through the same way from shot to shot, improving accuracy and tightening broadhead groups. This is achieved by simply adjusting the patented tuning stud. B.A.T. 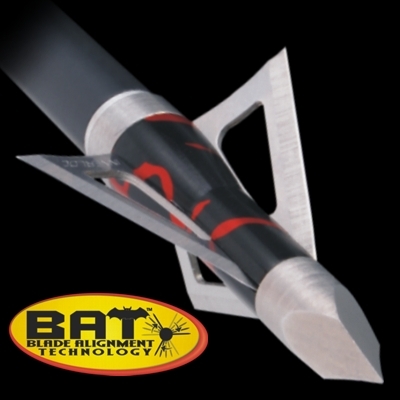 “Blade Alignment Technology” is the only technology that allows you to “TUNE” broadheads to carbon arrows. 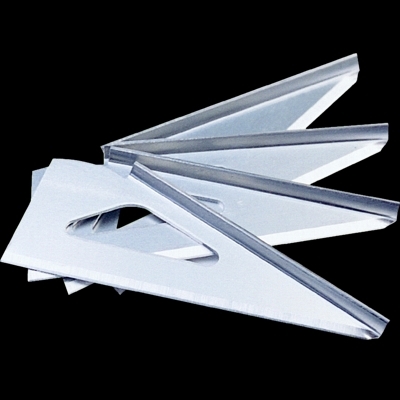 All Falcon™ series broadheads have our CLSII™ blade retention system and feature an ultra compact design, cut on contact tip configuration, rear blade loading and clamping, and of course BAT™. #1:The matching bevels at the back of the ferrule and inside the edge of the base create a “clamping” action when the assembly is tightened to an arrow. The ferrule, base, blades and stud are forced together so tightly they perform much like solid metal. #2: The blades are “L”-shaped for unmatched strength and the base of the “L” is curved to lay perfectly against the round shaft of the assembly stud. Metal to metal contact top to bottom! #3: The heart of the Center Locking System II™ is the assembly stud. 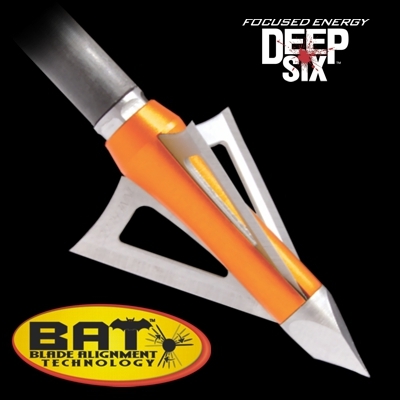 It extends throughout the length of the broadhead. This provides superior alignment, strength and allows for simple tuning by making an adjustment to the stud prior to screwing onto an arrow. Carefully slide the blades into the body, keeping the curved portion of the blade flange against the inside hole. Slide the base portion of the broadhead over the tuning stud. The slots in the base point forward as shown. The stud can now be inserted between the blades inside of the body. As you slide the broadhead together you need to fit the slots in the base over the back of the blades. You now need to thread the stud into the body. There is friction on these threads caused by the blue thread adjustment material on the end of the stud. Because of this, we recommend the use of the supplied hex and broadhead wrenches. You need to align the blades on all of your arrows so they shoot from the bow exactly the same each shot. It’s not that critical how the blades are aligned (Blade up, to the fletching, ect.). Only that they are all the same once nocked to the bowstring. 1) Using the supplied broadhead wrench screw the broadhead onto the arrow and notice where the blades stop. 2) Judge how much rotation is needed to move the blades into alignment. Then unscrew the broadhead from the arrow, to make adjustment. 3) Holding the broadhead with the wrench, use the hex key to adjust the tuning stud. 4) Screw the broadhead back onto the arrow and notice it’s new position. Repeat steps 2 thru 4 if fine tuning is necessary. 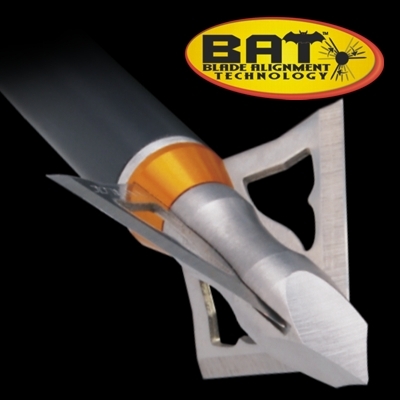 BAT broadheads have a 3 to 1 ratio to allow for precise tuning, this means 1 full turn of the alignment stud rotates the body and blades 1/3 of a turn when screwed back onto the arrow. From the factory, the stud is screwed all of the way in. This means your first adjustment will be by unscrewing the alignment stud. All adjustments can be made keeping the gap between the stud and the body base about the thickness of a blade, approximately 1 turn out.